Since 1997, RKR Hess’s parent company, Universal Technical Research Services, Inc. (UTRS), has provided a variety of comprehensive corrosion control services to myriad clients. As a result of UTRS’s recent acquisition of RKR Hess, its corrosion control services are now available to RKR Hess clients. UTRS’s corrosion control team comprises the highest caliber licensed professional engineers and construction managers, many of whom have decades of field experience and are highly respected by their cathodic protection industry colleagues. All of our project engineers are NACE International certified, and many of our lead engineers frequently teach NACE certification courses. In addition to its wide range of civil and environmental engineering services, RKR Hess will now be able to provide clients with such corrosion control services as: cathodic protection and alternating current (AC) mitigation for underground water, gas, and oil pipelines; cathodic protection of tank interiors and exteriors, including underground storage tanks (USTs) and aboveground storage tanks (ASTs); cathodic protection of reinforced concrete for bridges and tunnels; cathodic protection for submerged structures; and stray current services related to direct current (DC)-powered transit for heavy rail, light rail, and trolley systems. RKR Hess takes great pride in offering corrosion control services to our clients. The Corrosion Control Services Division offers a professional, rapid response and a high level of communication to meet each client’s needs. The focus of our services is providing accurate, advanced, and cost-effective solutions. Sample projects of particular relevance to water/wastewater system operators are provided below. 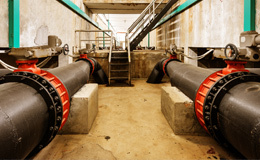 UTRS is a corrosion control consultant for the PWD, providing engineering services at various locations on the water distribution and transmission piping systems. The scope of work includes the design of corrosion control systems to address soil corrosion and stray traction earth current corrosion. UTRS also represents PWD during post-construction testing and initial activation of installed corrosion control measures. UTRS also conducts corrosion control assessment surveys, including a recent survey at one of PWD’s water filtration plants. UTRS designed, activated, and adjusted cathodic protection systems for two at-grade wastewater treatment tanks for the Eureka WWTP in Montgomery Township, Pa. The scope of work also included the procurement and installation of cathodic protection materials. UTRS designed the required impressed current system for each tank to provide cathodic protection to the submerged portions of coated steel tank walls that were exposed to untreated and treated wastewater. Since 2010, UTRS has conducted annual cathodic protection system surveys. Since early 2010, UTRS has had an annual contract with CorTrol, one of PWD’s corrosion control prime contractors. UTRS performs regularly scheduled periodic testing of PWD’s cathodic protection and stray current mitigation corrosion control systems. If a system is found to not be operating in compliance with previous criteria, UTRS conducts troubleshooting field studies to determine the cause of the noted system deficiency.